Visitors often come to Sapa in summer; however, if you have chance to come to Sapa in winter, you will realize how attractive Sapa is in winter. Located in the height of 1600m above the sea level, Sapa is such a Dalat (a cool temperate climate city in central highland) in the north of Vietnam. Since 1930s, Sapa was chosen by the French colonists to be the vacation destinations with the luxurious villas and stone caved roads in the middle of the peach gardens in spring. However, Sapa is just really in its time after the 38-km asphalted road connecting Lao Cai city to Sapa was renewed. Eventhough Sapa is a foggy city all year round, the fog is even thicker in Sapa in winter to make the land more mysterious and vague. The dew spread the city like a thin grey veil. The dew hides under the pickle pine tree line over the two street lines. The antique castles beside the modern villa along the bendy roads both exist. And when the warm sunlight of the winter comes, the dry trees will be filled with the beautiful sparkle flower bunches. Though Sapa is cold and wet by dew, the Sapa market is still crowded. The Vietnamese and international visitors are in the streets and many Hmong, Red Dao people are in the market. The white H’mong wear colorful costumes, while Red Dao girls wear pleiad scarf, etc. They come to the market to sell products and embroidery and buy the needies. Located in Muong Hoa valley, not far as 10km from Sapa town, Cat Cat village is a lively picture of culture of Mong people. The houses in the villages are all roofed with pomu lumber planks. The front room also used to sell embroidery and souvenir. Being not similar to dry Silver waterfall in the winter, the Cat Cat waterfall in Love Valley still throw its water from tens meter high in the somber dew. In the stream, the round stones are taken by the girls doing the washing. The small hydroelectric station built by the French 30 years ago still imposing stands. Ham Rong ecological area is like a winter sleeping princess. She is pretty and mysterious. Wandering in the small bending roads among the different shapes of stones, watching the peach and apricot trees, the visitors can feel they are lost in the dew. Not all the flowers are hidden from the winter. The white apricot still unevenly fluttered in front of the wind. The chrysanthemum is still yellow. And the bunches of orchirds still blossom with stirred beauty. In the warm stilt house in this place, visitors will have chance to watch the special ethnic show. 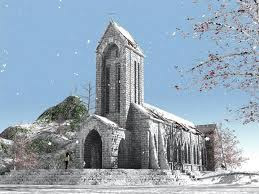 The Sapa church is plunged into the dew. Though being more than 100 years, the stones of it are still firm and being the time challenge. In the yard, many visitors are sitting around the specialties of grilled dishes of Sapa: sweet potatoes, chestnut, eggs, sugar-cane, etc. Visitors also want to enjoy the warmth from the oven. 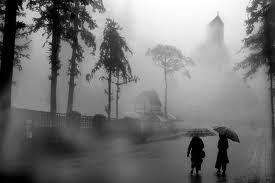 It is spectacular that in the middle of freezing Sapa of wind and dew, visitors still have warm stop like this. Sitting around the boiling pot, visitors can leisurely pick up the vegetable to eat. Sipping a spoon of hot “thắng cố” (a dish made from bowels of horse), the freezing cold seems to sudden disappear.